Do a Google image search for “arc flash labels” and you’ll find a bewildering array of label types, styles, and colors. In addition to the muddle of label formats, you’ll also notice there is considerable confusion regarding “correct” label content: timing intervals, the essential label information to include, and assorted other issues. If you’re responsible for the formatting and content of your company’s electrical distribution system safety labels, you’ll undoubtedly want to ensure you have the most effective and compliant labels possible –- and at a reasonable cost. Unfortunately, there is a lot of information to sift through in order to make effective electrical equipment labeling a reality. What sources of information guide arc flash labeling? When do labels need to be implemented? What specific information do arc flash WARNING labels require? What signal words and color schemes should be used on the labels? To begin this review of arc flash labeling standards, let’s first look at the sources –- the various regulations and standards – that inform arc flash label preparation and installation. Part of the problem we face when producing arc flash labels is that there is no one clear, authoritative guide for arc flash label preparation (format and content). Instead, the label requirements are spread across several consensus standards pertinent to this issue. OSHA has no specific requirement for such marking. A requirement to mark equipment with flash hazard WARNINGs was not included in the 1981 Subpart S revision. However, paragraph (e) of §1910.303 requires employers to mark electrical equipment with descriptive markings, including the equipment's voltage, current, wattage, or other ratings as necessary. OSHA believes that this information, along with the training requirements for qualified persons, will provide employees the necessary information to protect themselves from arc-flash hazards. Additionally, in §1910.335(b), OSHA requires employers to use alerting techniques (safety signs and tags, barricades, and attendants…to warn and protect employees from hazards which could cause injury due to electric shock, burns or failure of electric equipment parts. Although these Subpart S electrical provisions do not specifically require that electric equipment be marked to warn qualified persons of arc-flash hazards, §1910.335(b)(1) requires the use of safety signs, safety symbols, or accident prevention tags to warn employees about electrical hazards (e.g., electric-arc-flash hazards) which may endanger them as required by §1910.145. So, although OSHA does not have a specific requirement for arc flash labels, these labels are one tool in an organization’s toolkit that will enable it to comply with OSHA safety mandates. OSHA’s regulations are essentially performance based: they tell you what level of safety performance they expect, and you get to figure out how to accomplish it. Employers are responsible for (1) providing an electrically safe workplace for their employees and (2) documenting the means used to provide this protection. Following NFPA 70E and NEC requirements for electrical safety labeling gives employers an effective means of documenting the safe work procedures they’ve established for their electrical workers. This enables employers to comply with half of OSHA’s electrical safety requirements efficiently. Electrical arc flash labels have become the de facto industry set of best practices for protecting electrical workers from the serious threat of arc flash hazards. Since OSHA does not have a specific labeling requirement, it appears that the best approach is to use the other industry standards for (1) determining the details concerning labeling requirements and (2) providing a documentable means of satisfying OSHA's electrical safety requirements. Mainly, we will reference the National Electrical Code (NFPA 70-2017), the Standard for Electrical Safety in the Workplace (NFPA 70E-2018), and Product Safety Signs and Labels (ANSI Z535.4-2011). For the most part, the above-mentioned safety standards are consensus practices, not legal requirements. In other words, they represent a collection of industry experts presenting the accepted industry best practices for achieving and maintaining electrical safety. The exception to this is the National Electrical Code (or NEC). In most states, the NEC is legally binding having been incorporated into the various building codes. One caveat with the NEC is that most states adopt each new version of the NEC code on different time schedules. At the time of writing 19 states have adopted the 2017 edition of the standard, while the remainder has adopted a variety of older editions (2014, 2011 and 2008). For convenience sake, we will limit our discussion to the 2017 edition. The NEC is an important electrical safety document. Its original purpose, as written by the National Fire Protection Association (NFPA), was to protect our growing country from the burgeoning risk of electrical fires in our newly electrified cities, towns, and countryside. As time progressed, the NFPA expanded its defensive umbrella to protect electrical consumers from other attendant electrical risks of electricity: shock, burns, catastrophic failures –- and now arc flash. As significant as the NEC is to electrical safety, we must recognize that its protection is intended to cover the electrical equipment itself so that the equipment is safe for the equipment user. If electrical equipment is designed and installed according to the NEC, equipment users can have a reasonable expectation that the equipment will not harm them. The NEC does little, however, to protect electrical maintenance workers. When equipment breaks down or requires scheduled maintenance, maintenance workers are often exposed to electrical hazards. This occurs because they essentially have to bypass the built-in NEC-style safeguards in order to complete repair or maintenance operations. Consequently, a new standard was required in order to protect these workers. In 1976 the newly minted OSHA body formed a committee to provide just such a standard. 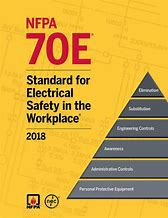 They published the first edition of NFPA 70E in 1979 with the purpose of protecting vulnerable electrical maintenance workers. Eventually, the application of arc flash labels grew out of subsequent editions of NFPA 70E. The other industry standard that has had a significant impact on arc flash labeling is Product Safety Signs and Labels (ANSI Z535.4-2011). NFPA 70E references, but does not specifically require, Z535 for guidance in the design of arc flash labels. Z535 is the national standard (also correlated with international standards) for identifying the color, signal-words, and symbols used to identify the magnitude and type of hazards that may exist in the workplace (or anywhere). Some of the diversity found in arc flash labeling is due to differences in interpreting the Z535 standard. As indicated, NFPA 70-2017, NFPA 70E-2018, and ANSI Z535.4-2011 are the primary documents needed for informed guidance in the preparation of effective arch flash labels. There are some other minor sources that impact label design or content. During this series, these will be discussed at the appropriate times. In the next installment of this series, we will begin probing the details of arc flash labeling as extracted from our three main reference sources. Specifically, we will answer two questions: “What needs to be labeled?” and “When do labels need to be implemented?